Sydney and Leslie Piddington were an Australian husband and wife mentalism team who in the late 1940's presented a series of live radio broadcasts for the BBC, comprising of specialized tests devised to demonstrate Lesley's ability to receive thoughts over a great distance. In this 30 minute video you will learn an effective, easy to prepare and simple method, which will enable you to replicate the style of long distance telepathy experiments made famous by the Piddington's. With very little preparation you'll create the illusion that you possess the ability to silently transmit randomly selected audience information to another person, who can if you wish be a thousand miles away in different country. 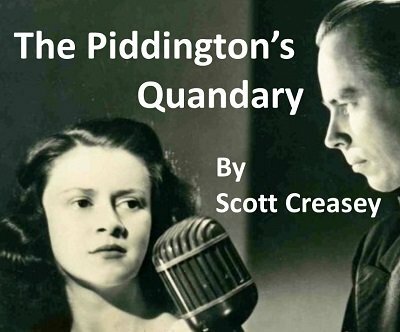 "The Piddington's Quandary may be your very best 'packs small plays big' release yet! TPQ would make an ideal closer for a stage show, a great publicity stunt, or both. Really liked the mini documentary style at the beginning of the DVD. Once again, you have released another brilliant routine with extremely deceptive and clever workings that is easy to execute. No difficult sleights. No unnatural moves. Every step in the sequence smooth and beautifully justified. Seriously underpriced" - Bill O'Connell.